A continuation of 9-17 line after programme was cancelled in 1998 was new design 9-18 - a different approach to SMT conception after personal changes in MiG bureau. New avionics were applied (Ramyenskoye PKB) in glass cockpit, and only external fuel tanks are used, one under fuselage and two under wings. One aircraft was build in 2003 and displayed in many countries, potentially customers. 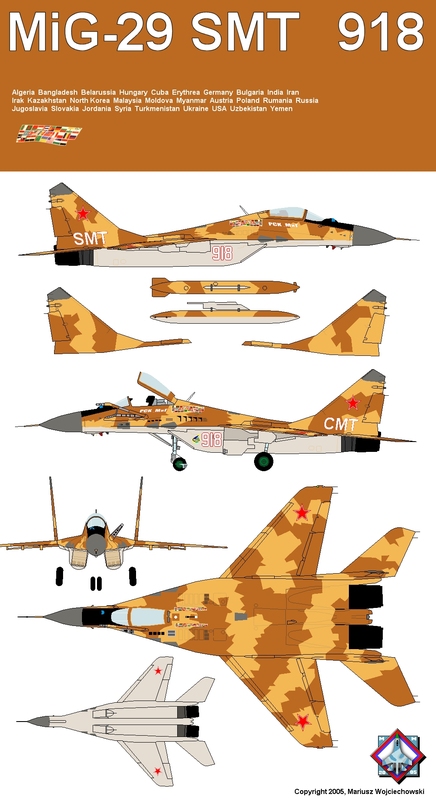 Became a pattern for Yemeni and Eritrean MiGs. No special trainer version. As trainer is used MiG-29UB in 9-53 variant. Product 9-18 is considered not so good, because only external tanks were used, so new project SMT 9-19 was designed in 2005. MiG-29SMT 9-18, prototype for Yemen. Probably the prototype was built using one of the owned by MiG bureau airframes of the MiG-29SM. Nice camouflage, on serial aircraft colours are similar. Displayed on many international exhibitions and shows (see flags on fuselage). MiG-29SMT #918, 2003. Drawing accuracy: 100%. 2004-2005 Yemen: 6 new and 14 MiG-29SE rebuilded. 2005 Eritrea: 2 MiG-29SE rebuilded. Product 9-18 it not so good, because only external tanks were used, so new project SMT 9-19 was designed in 2005.